I just added these two new cookbooks to my collection and within a few short weeks they are already showing signs of wear and tear as I madly make one recipe after another from them. Both are written by Lindsay S. Nixon. The first one, Happy Herbivore was published earlier this year in February and the second, Everyday Happy Herbivore was just released. Amazon exclaims, “Lindsay S. Nixon is a rising star in the culinary world, praised for her ability to use everyday ingredients to create healthy, low-fat recipes that taste just as delicious as they are nutritious. 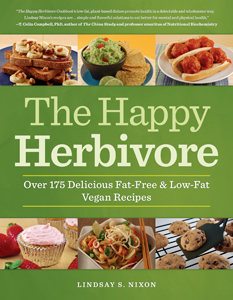 Lindsay’s recipes have been featured in Vegetarian Times, Women’s Health Magazine, and on The Huffington Post.” Lindsay’s Happy Herbivore is now one of Amazon’s best selling books for 2011! There are more than a few things I enjoy about her books. For one, she does use everyday items most people have available to them. You don’t have to run to any specialty stores in search for a spice you never heard of before. And even more impressive is that if you don’t have Vegan Mayo, Worcestershire Sauce, Berbere or No Chicken Broth she has the recipe to make it right there in the book! And once again, they don’t consist of specialty items you never heard of before. It’s such a simple concept yet to have the ability to throw a spice mix or something like no-chicken broth together makes cooking so much easier . . . and enjoyable. I have found that I don’t even buy broth or Worcestershire sauce anymore. It’s easier just to make it yourself as you need it and store it in the pantry or refrigerator. I love having the ability to be self sufficient when it comes to cooking. Learning some of these simple condiment recipes makes me feel like a true chef, not having to rely on a bottled version which typically has some sort of filler or preservative in them. It also allows you to tailor some of these spice and condiment recipes to your taste. Since items like these are used as a base or accent to dishes, the end result is that much better. Because her recipes are so easy to make, I have found they are also easy to alter. I’ll admit I have altered most of the recipes I make from both cookbooks. It’s nothing groundbreaking but the simple ingredients are easy to change up a little and I just can’t help myself. I find that I often add a few more spices or more of a called for ingredient. This isn’t necessarily a bad thing and I actually prefer it. Lindsay helps you build knowledge and a base for whatever you are making. Her recipes are delicious as-is. But if your tastes desire something more complex or if your refrigerator doesn’t have a zucchini, her recipes are easy enough to understand and simple enough in design that they work very well if you need or want to change it up a little. Up to now, I have been in search for a cookbook author that does not use refined flour in their baking recipes. When I do find a book that does this, usually the mix of flour is half whole wheat and half all purpose white flour. Or the recipe will be all whole wheat but so complicated that I don’t have time to learn the technique. As I flipped through her books, my heart skipped a beat when I found every, yes EVERY recipe that uses flour is WHOLE WHEAT. No mixes, nothing complicated. These books are true, honest, simple and good-for-you recipes. Easy to make and easy to find whole foods. This is what Vegan and Vegetarian cooking should be all about. Great review! I haven’t purchased either of these books yet, but I have been wondering if they deserved a look. I’m definitely going to check these out. I will be posting recipes from her books over the next couple weeks as well. I’ll make sure to reference the book so you know which ones are from it. Enjoy!